South and North Korea are set to hold high-level talks Monday to discuss holding a summit meeting between their leaders aimed at deepening inter-Korean relations. The meeting will be held at the northern side of Panmunjom that separates the two Koreas at about 10 a.m., according to the unification ministry. South Korea's delegation will be led by Unification Minister Cho Myoung-gyon. His North Korean counterpart will be Ri Son-gwon, chairman of the Committee for the Peaceful Reunification of the Country. "(We) will discuss the overall implementation situation of the Panmunjom Declaration and things that will be carried out going forward," Cho told reporters before departing for the talks, referring to the agreement reached in the historic April summit. "Views will be changed as well with regard to the autumn summit meeting agreed upon in the declaration," he added. The talks will mainly focus on ironing out details, such as the date and venue for what will be the third summit meeting between South Korean President Moon Jae-in and North Korean leader Kim Jong-un. 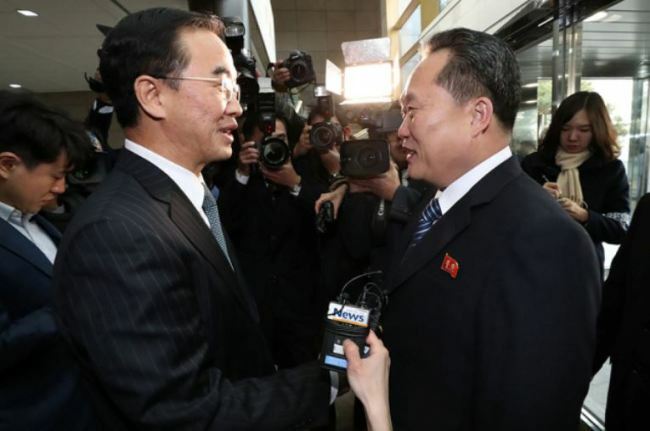 The two agreed to hold their summit in Pyongyang in the fall following the first meeting in April and second in May. The high-level talks come amid growing concerns that the denuclearization process has been slower than expected since the June 12 summit between North Korea and the United States. The two countries appear to be accusing each other of dragging their feet in implementing what their leaders agreed on at the historic summit. The US has urged the North to intensify its denuclearization efforts, while the North has argued that the process should be carried out in a simultaneous and phased manner. Pressure appears to be mounting on South Korea to play a role in reaching a breakthrough in the apparent stalemate in talks on North Korea's nuclear weapons program. During Monday's talks, the two Koreas are also likely to discuss what has been implemented since their previous summits, especially on their promised efforts to expand cross-border exchanges and cooperation. Since the high-level meeting in June, they have had talks to discuss details on cooperation in various areas, including railways, roads and sports.